Your righteousness is like the mountains of God. Yahweh, you preserve man and animal. I believe that all creation is constantly speaking about our Father's kindness. 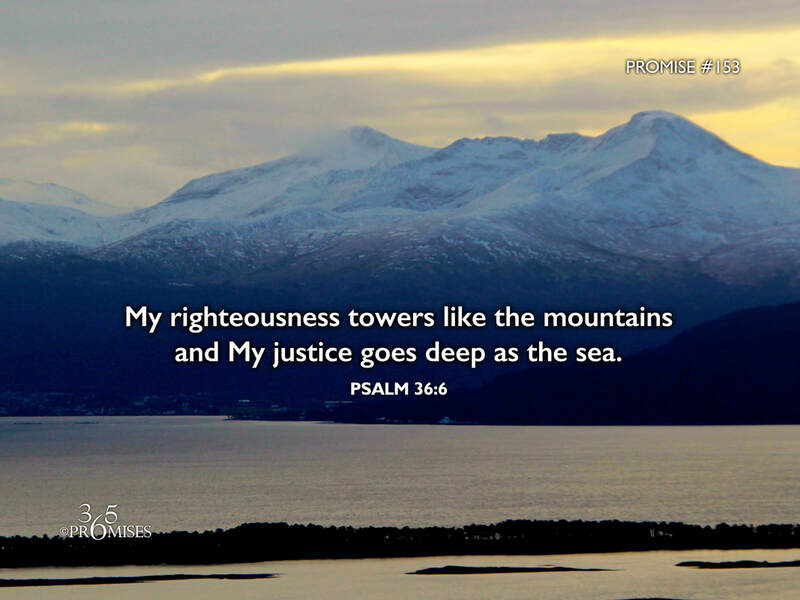 In today's promise, King David declares that the righteousness of our God towers like the majestic mountains of the earth and His justice goes as deep as the deepest part of the sea. If we look for it, every aspect of nature will help us comprehend the greatness of our God. The mountains speak of His righteousness, the seas speak of His justice. The birds and the flowers speak of His daily provision. Thunder and lightning speak of His majesty. May each one of us hear God speaking in all that surrounds us in this great world that we live in. As Jesus told us in Matthew 6:26... Look at the birds of the air: they neither sow nor reap nor gather into barns, and yet your heavenly Father feeds them. Are you not of more value than they? (ESV) All creation is bearing witness to the amazing love of our Heavenly Dad. May we see His goodness in a fresh new way today as we look at all that He has created.